This simple crochet tutorial will help you to learn how to crochet the lace crochet with flowers. 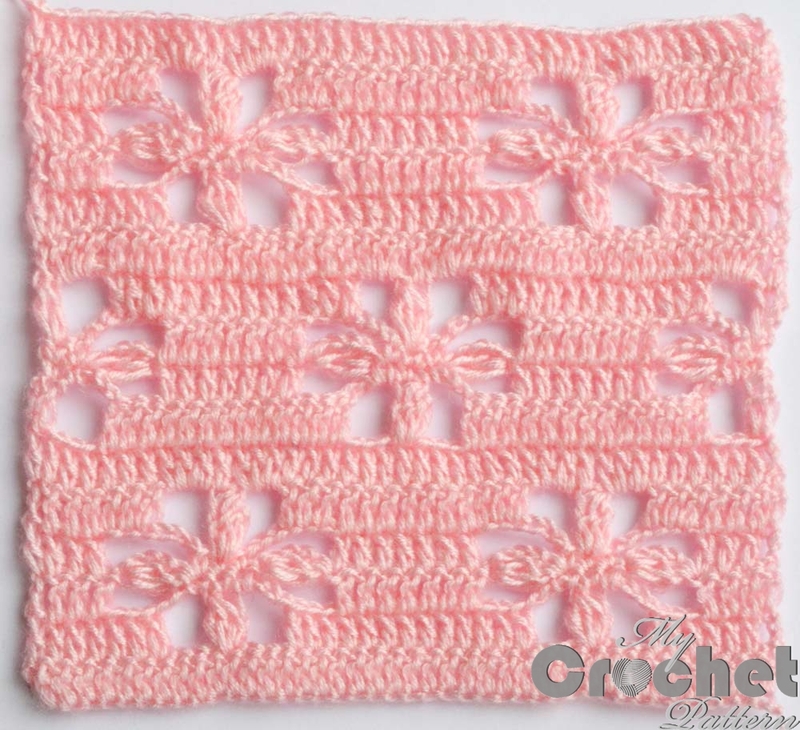 The lace crochet pattern with flowers would be great for blankets, sweaters and shawls. You can download and print this free pattern in the end of the post. Foundation chain: 61 + 3. Row 1: 1 dc into 4 ch, *1 dc into next ch, rep from * to the end, turn. Row 2: 4 ch, 1 trc into 1 dc, *4 ch, skip 3 dc, 13 dc, 4 ch, skip 3 dc, 3 trc cluster into next dc, rep from * to the end, turn. Row 3: 3 ch, 3 dc, 4 ch, 2 trc into 1 ch, skip 3 dc, 1 sc into arch, 1 sc into cluster, *1 sc into arch, 4 ch, 2 trc into 1 ch, skip 3 dc, 7 dc, 4 ch, 2 trc into 1 ch, skip 3 dc, 1 sc into arch, 1 sc into cluster, rep from * to the end, turn. Row 4: 1 ch, 2 sc, 6 ch, *7 dc, 6 ch, 3 sc, 6 ch, rep from * to the end, turn. Row 5: 3 ch, 3 dc, 3 dc into arch, 3 ch, skip 1 sc, 3 trc cluster into next sc, *3 ch, skip 1 sc, 3 dc into arch, 7 dc, 3 dc into arch, 3 ch, skip 1 sc, 3 trc cluster into next sc, rep from * to the end, turn. Repeat rows 1 – 5 until you have reached your desired length.